Are Current U.N. Sanctions Insufficient to Deter North Korea’s Nuclear Proliferation? Parading this through downtown Pyongyang may not be the best way to win friends and influence others. Immediate international concern followed. Regarding North Korea’s nuclear test, President Obama of the United States said “[t]his is a highly provocative act that threatens regional stability, breaches U.N. resolutions and increases the risk of proliferation, calling for ‘further swift and credible action by the international community.” Almost immediately, the United Nations contemplated additional sanctions, leading to North Korea condemning the international community, threatening to end the cease fire between North and South Korea and threatening a pre-emptive nuclear strike against the U.S. In response, the 15-member U.N. Security Council voted unanimously on March 10 against North Korea imposing additional sanctions. These sanctions strengthened the prior 2006 Security Council Resolution issued by the U.N. in response to North Korea’s first missile test, asserting banking, trade, and travel constraints against North Korea. North Korea is no stranger to disregarding U.N. threats and continuing its nuclear testing. On three prior occasions, North Korea has conducted nuclear tests. Following each event, the U.N. issued three separate resolutions in 2006, 2009, and 2010. Thus, the question becomes what U.N. action will sufficiently deter North Korea and, hopefully, bring at least a little more cooperation between the international community and North Korea? Prior resolutions against North Korea have been unsuccessful. The 2006 resolution states that the Security Council “[d]ecides that the DPRK shall suspend all activities related to its ballistic missile programme and in this context re-establish its pre-existing commitments to a moratorium on missile launching.” Comparatively, the 2009 resolution reiterates that the Security Council “[d]ecides that the DPRK shall abandon all nuclear weapons and existing nuclear programs in a complete, verifiable and irreversible manner and immediately cease all related activities.” Obviously, such U.N. “decisions” pose little threat or effect to North Korea, a non-member country of the U.N, because North Korea follows such measures by additional nuclear testing. While the United Nations and its member countries remain hopeful of change, North Korea appears to be un-persuaded. Mr. Choi, representative for South Korea, speaking in 2006, “urge[d] North Korea to heed carefully the united voice of the international community and to refrain from any action that would further aggravate the situation on the Korean peninsula. North Korea should return immediately to the Six-Party Talks without any preconditions. 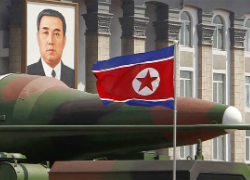 North Korea should abandon its nuclear weapons and missile programmes once and for all.” However, as seen, North Korea ignored the hopes of the South Koreans by conducting additional missile tests in 2009, 2010, and now most recently, 2013. If nuclear testing by North Korea bears such a threat to the peace of the international community, would harsher sanctions provide a reprieve? The U.N. is able to provide broader sanctions, including military action, under its charter. 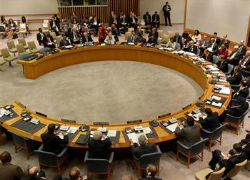 The U.N. Security Council’s authority vests in Chapter VII of the U.N. Charter. Under Chapter VII, Article 39, the Security Council has such right to “determine the existence of any threat to the peace, breach of the peace, or act of aggression and shall make recommendations, or decide what measures shall be taken in accordance with Articles 41 and 42, to maintain or restore international peace and security.” Article 41 provides lesser economic sanctions which “may include complete or partial interruption of economic relations and of rail, sea, air, postal, telegraphic, radio, and other means of communication, and the severance of diplomatic relations.” Article 42 grants greater military authority “should the Security Council consider that measures provided for in Article 41 would be inadequate or have proved to be inadequate, it may take such action by air, sea, or land forces as may be necessary to maintain or restore international peace and security. Such action may include demonstrations, blockade, and other operations by air, sea, or land forces of Members of the United Nations.” Thus, if necessary, the U.N. may order military action against North Korea. What sanctions to impose today? The lack of effectiveness of economic action under Article 41 is apparent in North Korea’s continued nuclear testing. One problem with the imposition of economic sanctions against North Korea is that they are enacted and enforced weakly. Orde F. Kittrie, associate professor of law at Arizona State University, finds that U.N. nuclear sanctions pose one of four goals: (1) coercing a change in target behavior, (2) reducing or containing target ability to implement policies, (3) deterring other actors contemplating the same behavior, and (4) future possible sanctions. While Kittrie notes that such tactics have been successful regarding nuclear proliferation in Iraq, the former Yugoslavia, and Haiti, sanctions against North Korea proved insufficient in 2006. Sanctions depriving North Korea of travel and luxury goods provide little deterrence for nuclear testing and are merely an annoyance for an area known as the “Hermit Kingdom.” As such, weak economic sanctions pose little threat to North Korea, providing little deterrence in terms of nuclear testing. Some U.S. and U.N officials believe that new sanctions imposed in 2013 will “bite, and bite hard” against North Korea, regardless of past sanctions showing little impact. However, many others see the same problems of the 2006 sanctions occurring in the 2013 sanctions. While the 2013 sanctions make funneling cash more difficult, these sanctions also embargo the similar sale of high-end luxury goods including “yachts and jewelry.” Nor do the 2013 sanctions prevent China from providing food, energy assistance and investment, as Doug Bandow of the Cato Institute notes. As Kittrie previously said in her 2007 article, these types of economic sanctions appear to provide more of an annoyance, rather than deterrence. Additionally, economic sanctions may simply be ineffective against North Korea’s political and economic ideologies. North Korea has long suffered from food shortages and economic struggles, leading to self-reliance rather than international trade. Luxury items are discouraged and seen as harmful to human development. Thus, economic sanctions have little deterrence against the economically self-reliant North Korea. While it remains to be seen if the 2013 sanctions will effectively deter North Korea from persisting in nuclear testing, it is also questionable whether harsher restrictions should be placed against North Korea. As U.N. Charter Articles 41 and 42 state, the U.N. Security Council possesses stronger authority to deter North Korea than its current economic sanctions. However, current sanctions seem to have only made relations worse between North Korea and the international community, while resulting in little deterrence. Most importantly, the implementation of current U.N. sanctions has not only led to threats by North Korea, but North Korea’s abrogation of “all agreements on non-aggression reached between the North and the South.” Lawmakers such as Susan Rice, U.S. ambassador to the U.N., maintain that increasing “North Korea’s isolation” through sanctions is the best option; however, past experience indicates the ineffectiveness of this approach. Rather, it appears that such isolation techniques have led to an increase in nuclear testing and a decrease in communication between the international community and North Korea. While it remains to be seen whether the 2013 sanctions against North Korea will effectively deter nuclear testing, the past indicates that these sanctions will not. The 2013 sanctions have already led to substantial ill-will between North Korea and the international community and little indication that North Korea will cease testing. As such, the question remains of whether the answer is for the U.N. to invoke harsher sanctions, including potential military action under Article 42, or whether a different approach would lead to better results. Brad Bossenbroek is a third year law student at the Sturm College of Law, an editor on the Denver Journal of International Law and Policy, and a Publishing Editor for The View From Above. Orde F. Kittrie, Adverting Catastrophe: Why the Nuclear Proliferation Treaty is Losing its Deterrence Capacity and How to Restore it, 28 Mich. J. Int’l L. 337, 355-80 (2007). Karen M. Takishita, Economic Sanctions Against North Korea: An Unsuccessful and Sanctimonious Policy Ripe for Modification, 14 Pac. Rim L. & Pol’y J. 515, 530-33 (2005). After the recent escalation in its rhetoric, the NK may have exhausted all the tricks it has in its bullying tactics. It seems it is likely to face a situation where it would lose face when it is ignored by all others. The international community should not resume or even consider to resume any talks with NK until it backs down by itself totally and completely. China should reduce its trade and particularly aid with NK each time the NK plays bully, to make NK’s life more difficulty to send signals that its wayward bully will not work in its own interests but only the contrary. Magnificent put up, very informative. I wonder why the other specialists of this sector don’t realize this. You should continue your writing. I am sure, you have a great readers’ base already!|What’s Happening i’m new to this, I stumbled upon this I have found It positively useful and it has aided me out loads. I am hoping to give a contribution & assist other customers like its helped me. Great job.